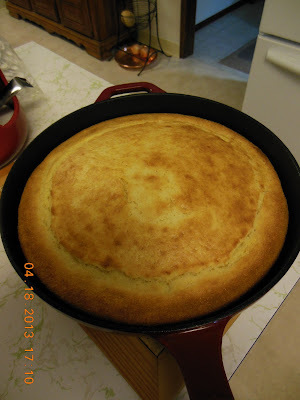 Corn bread, our favorite! - Our Sunday Cafe, the Retirement Edition! This batch in the new house, the same type of oven (convection), who knows why! actual source unknown, this has evolved. We LOVE corn bread (with chili, of course). :) And we went blackberry picking four times this year; a new record! I froze a whole bunch, too, but am sad to say we only have a few cups left in the freezer and a couple cups of dehydrated ones (great in scones and cereals). Thanks for sharing! The cornbread looks good. I like mine a little on the sweet side also. By tamale corn meal, do you mean masa harina? Thanks for stopping by my Sweet Basil Kitchen! Now that soup season is upon us, I will be making lots of bread. Your corn bread recipe is bookmarked! I love a good cornbread too. A little honey butter and it's perfection! I also prefer it on the sweet side-- just like you! Love your blog and now you have a new follower! THis bread looks very tempting! I definitely should try it!